A call upon myself to explore those kitchen challenges I always wanted to try but never got around to. I thought it was a personal goal–that I was on this journey alone–but then Kate saw my mission and soon there were two of us upon the same road. Sharing the adventure made it all the more sweeter and in no time, we opened up our twosome to others, hoping they would find the same pleasure we had in overcoming our fears. First on the First brought many wonderful people to my virtual table. I am so grateful that Kate reached out to me when she discovered my quest and asked if she could join in. 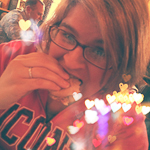 She was one of the first blogger friends I made, back at a time when I felt very alone in the world. Over the years, others were beckoned by the call of the quest, some to stay for a challenge or two, others as regulars who could be counted on to rise to the occasion and slay each dragon along the way. I highly urge you to explore the First on the First tag and discover these women for yourself. I will definitely miss our regular meetings. What I won’t miss is the stress. Since First on the First’s invention, my life has changed dramatically. I graduated college and moved on from my stint as a stay-at-home-mom to a mom who works full-time outside the house. We bought a house and moved. Our kids grew older and much busier. In short, life is, in many ways, more full now than it was when I was trying to fill the void left by leaving the workforce. And that’s a very good thing. But it also means my time is much more precious, divided into tiny pieces that I have to try to distribute evenly among all my family, friends, and pursuits. And a standing monthly challenge–my own challenge, put out there by my own keystrokes–has transformed what was an adventure into a bit of a chore. That wasn’t my intention at all. This will be the last First on the First challenge. I’d rather bid a fond farewell than curse something under my breath that dragged on for far longer than it should have. Thank you all for your contributions, comments, and commitments to this journey. I couldn’t have done it without you–and it wouldn’t have been as rich, either. I’m glad to have had this experience and shared it with all of you! And so, we’re going out with a bang… with a dessert consisting of a thousand sheets, representing all the layers of our lives that have combined to create something just a little bit sweeter. If you rely on store-bought puff pastry (which I did…see the paragraph above), it’s not a particularly difficult challenge. You’ll see the pastry cream again, something we’ve used before in eclairs and croquembouche. 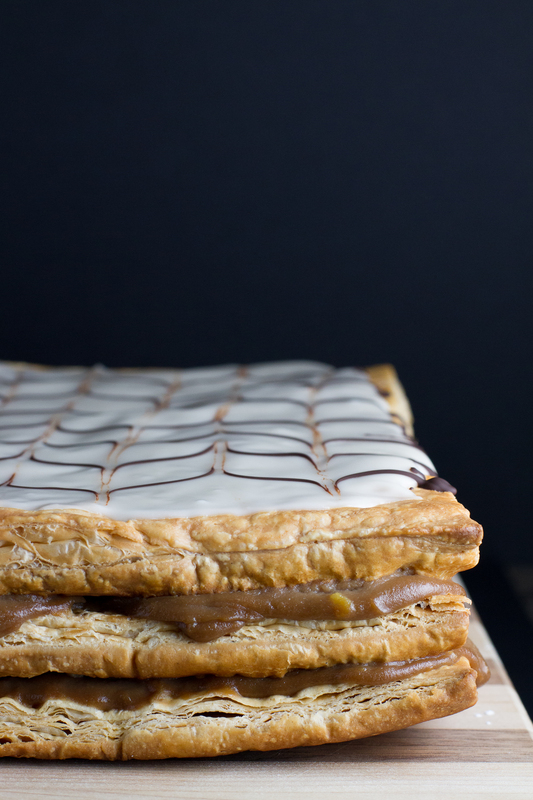 If you do decide to make your own puff pastry, the technique isn’t all that different than croissants. We’re building on skills here to create something new. Something I will continue doing without the monthly group, and I hope you will, too. Thank you, again, ladies for turning your ovens on one last time with me! What a delicious journey this has been! about Preheat oven to 425 degrees Fahrenheit. Get out 2 baking sheets and cut 2 sheets of parchment paper to match. Set aside. In a medium heavy-bottomed pot over medium heat, combine the milk and half the sugar. Heat until it just starts to bubble, then remove from heat. In a medium mixing bowl, beat the egg yolks, cornstarch, and vanilla extract. While whisking, slowly dribble about ⅓ of the hot milk into the egg mixture. Beat vigorously to temper the eggs. Whisk the egg mixture into the remaining hot milk and return to the stove. Heat over medium flame until it starts to bubble, then continue cooking for 3 minutes to cook off the starch taste from the cornstarch. Remove from heat and add the Nutella, stirring until well incorporated. Transfer to another container and cover the surface with plastic wrap. Refrigerate until cold, up to 24 hours in advance. Take out the puff pastry sheets. My oven is a small wall oven, so I can't even fit a half sheet pan in it. Hence, I had to bake 1 puff pastry sheet at a time. Unfold one puff pastry sheet. 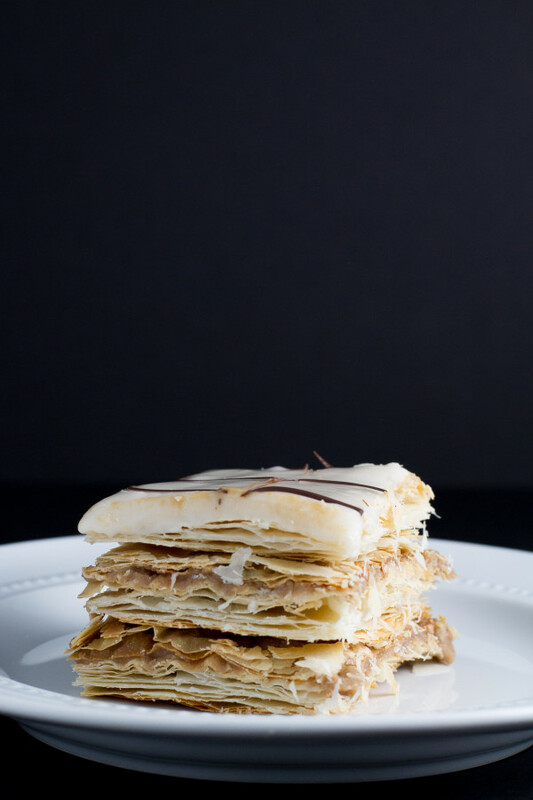 Lay out a piece of parchment paper on one of the baking sheets and place the puff pastry in the middle of it. Lay the other piece of parchment paper over the top and place the other baking sheet on top to keep it from puffing up too much in baking. Bake on the center rack for 18 minutes, then remove the top sheet and bake for an additional 3-4 minutes, or until lightly browned. Remove to a cooling rack to cool completely. Repeat with remaining sheets of puff pastry until you have 3 squares. Once you are ready to assemble, prepare the glaze in a medium mixing bowl. You'll only want to add enough milk to get it to a thick, oozy consistency. You don't want it to be so thin that it drips right off. So be careful, add the milk 1 Tablespoon at a time, and stir thoroughly between each addition. I only needed about 2 Tablespoons for the consistency I got, but it could vary for you. Place the chocolate chips in a zip top bag and place that in a microwavable bowl. Microwave on medium heat for 30 second intervals, squeezing the contents in between each to help it melt more evenly. 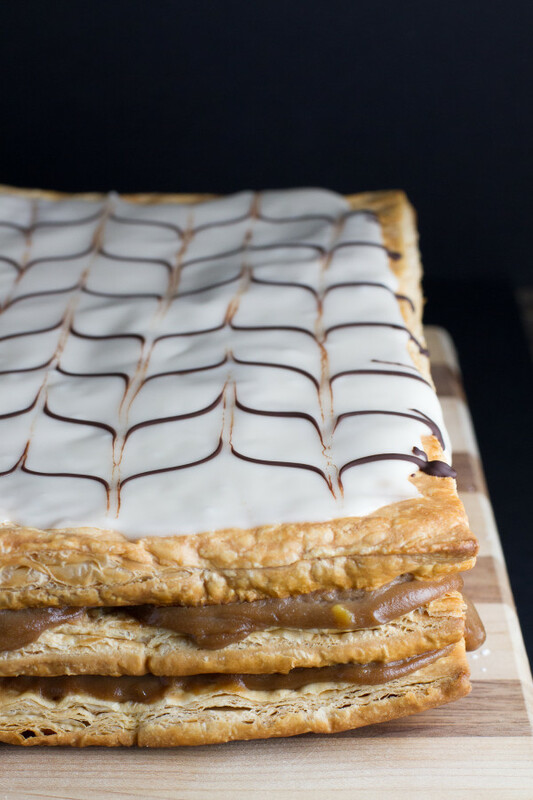 Lay out a piece of puff pastry and spread over it half the Nutella pastry cream. Place another sheet of puff pastry on top and repeat with the remaining pastry cream. Place the remaining sheet of puff pastry on the top and spread the glaze over that. Snip the corner off the zip top bag with the chocolate creating a very small hole. Pipe lines of chocolate about an inch or two apart. Using a toothpick, drag lines perpendicular to the chocolate every inch or so, alternating directions. Chill for at least 3 hours before serving. Trim the edges before cutting to serve. Make sure you're using a very sharp knife, as this quickly gets messy. I chose not to roll out the puff pastry dough as I've had bad luck in the past with it not being as flaky. 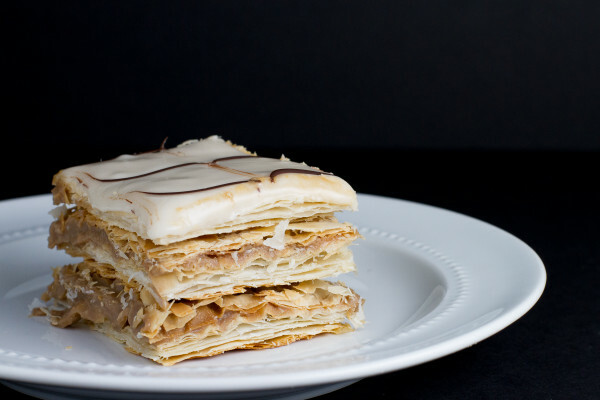 If you would prefer, though, you can use one box of puff pastry for this recipe. 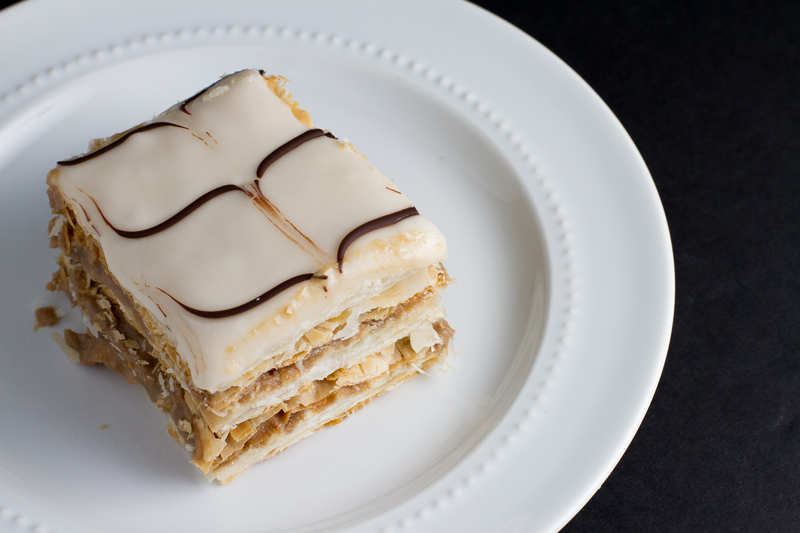 Roll out the sheets so you get 3 10"x10" squares to use for your mille feuille layers. I’m so happy to have shared this journey together. I’ve grown so much in our years together and a lot of that had to do with the challenges we tackled through First on the First. Until I started writing the post for the final challenge I don’t think I even realized how long we had been at it. It’s been incredible! And this mille-fueille is equally incredible! Love the nutella pastry cream. Yum!